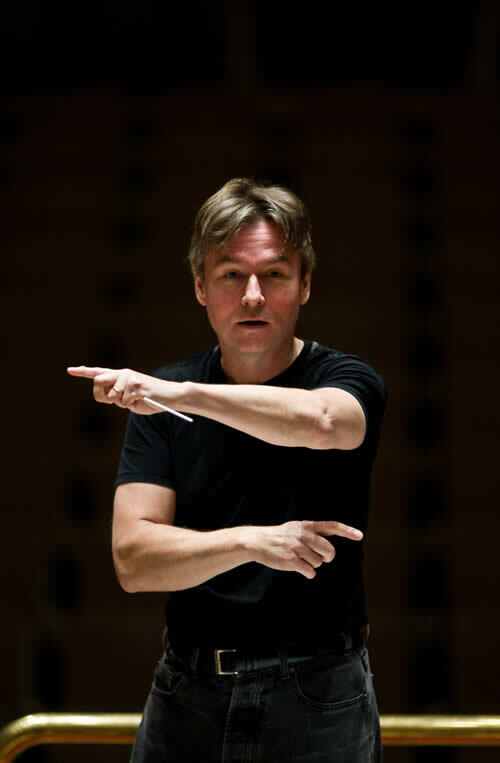 Esa-Pekka Salonen is certainly among the most popular of classical musicians world-wide, but here in Southern California, it’s on a slightly different level. You’d expect the current Conductor Laureate and former Music Director of the Los Angeles Philharmonic to have a strong following among the locals, and sure enough, he got a loud and prolonged ovation the moment he walked out onto the Walt Disney Concert Hall Stage. Yes. Yes, he is. Even a guy stuck in a booth four stories beneath Grand Avenue knows it. Tuesday night, Esa-Pekka the Great brought the Philharmonia Orchestra into WDCH, a quick one-night stop before heading further south to Costa Mesa and eventually San Diego. Of the three programs he and his London cohorts brought on tour, Los Angeles got the most challenging one: a semi-staged performance of Berg’s landmark opera, Wozzeck. Only someone as truly great as Mr. Salonen would have the cajones to bring such a work on tour AND be able pull it off as magnificently as he did. It was dramatically intense and musically rich in detail. A work as dark and tragic as this can often sap the energy out of a room and leave everyone drained and depressed. Mr. Salonen somehow found away to not only engage the audience but to energize it, injecting a bit of the title character’s mania into one’s psyche. It helped that he was willing to ease off the accelerator pedal from time to time, even allowing for some fleeting tender moments between Wozzeck and Marie. Of course, it also helped that Mr. Salonen brought along some excellent singers to play the challenging roles, and all of the principals offered convincing interpretations. Johan Reuter sang the title role with clarity and conviction, offering an organic evolution in his tragic character from unsettled and uncomfortable to truly disturbed; it was easy to be both scared and sympathetic as you watched him. Angela Denoke was the vocal standout; she inhabited her Marie, equal parts cause and victim of Wozzeck’s anguish, with a complexity that came through powerfully in both her singing and her stagecraft. Wozzeck’s three tormentors — Peter Hoare as a sniveling captain, Kevin Burdette playing a sadistically self-possessed doctor, and Hubert Francis as the lustful, preening drum major — added richness and depth to Wozzeck’s troubled world. Anna Burford was a saucy Margret. The rest of the cast ably contributed in each of their smaller roles, as did the chorus, children’s voices, and supplemental instrumentalists imported from Northern California. The Philharmonia’s sound was similar to the LA Phil’s during Mr. Salonen’s 17-year tenure in LA: bright and muscular, yet transparent. In fact, given their history of sharing many of the same conductors over the years (Klemperer and Giulini to name just two more), there has always seemed to be more of a connection between the LA Phil and their South Bank brethren than with London’s four other orchestras. Kevin Burdette (last seen at WDCH as the marionette-like Leporello) was a late replacement for Tijl Faveyts, who unfortunately had to back out due to a throat infection. He was the only member of the cast who used sheet music, which given his extremely late notice, was perfectly reasonable. More importantly, it was only minimally distracting; in fact, they managed to use it as an effective prop, with Mr. Reuter’s servile Wozzeck carrying around stand and sheet music for Burdette’s Doctor. This marks the third opera that Mr. Salonen has led in Los Angeles in as many years (with the world premiere of Shostakovich’s Orango last year and Duke Bluebeard’s Castle by Bartók the year before). If The Rake’s Progress isn’t already on the docket for next season, can I request that it be scheduled for 2014 or 2015? Someone please let EPS, or Deborah Borda, or Chad Smith know. Walt Disney Concert Hall was only about 2/3 full by my very unscientific observation, but the crowd there was enthusiastic and extremely attentive. Intrusive coughs were few, and there was minimal rustling in-between acts. Given that there were no intermissions, this was particularly impressive. Among those in the audience was Dean Corey, President of the Philharmonic Society of Orange County. Tags: Berg, Esa-Pekka Salonen, Philharmonia. Bookmark the permalink.